In 2009/10 the number of new jobs created were very similar, 782 in the metropolitan areas compared to 770 in the shires. The projects that created the highest number of jobs in the West Midlands metropolitan areas included FourstaR of the Netherlands, where their headquarters for employment training and skills in Birmingham is expected to employ up to 275. Shanghai Automotive also created jobs by creating a new engine test facility at Longbridge. Portugal’s ALERT Life Sciences plan to employ over 100 at their facility in Solihull, which provides ICT support to the NHS. In the shires, Fortis Insurance of Belgium are looking to take on 150 new staff. France’s giant power transformer manufacturer Areva are expanding with 100 new jobs in Stafford and the USA’s TK Maxx are taking on another 100 employees at their distribution centre in Newcastle-under-Lyme. By far the largest acquisition in the West Midlands in 2009/10 was Cadbury’s acquisition by Kraft Foods of the USA, affecting 2,900 staff at the headquarters in Bournville and many hundreds more around the country. 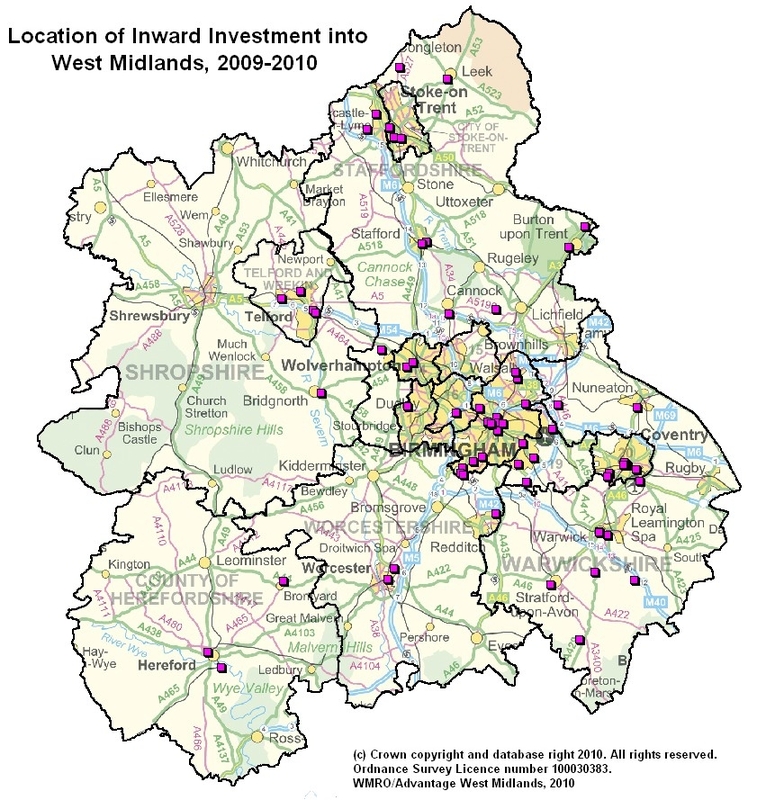 Within the West Midlands, Birmingham and Warwickshire received the highest numbers of inward investment projects — 21 projects each — almost half of all projects this year. However, the figures for Warwickshire include 13 which were set up in specially managed offices catering to inward investors, principally through Advantage West Midlands‘ Bridge to Growth scheme. 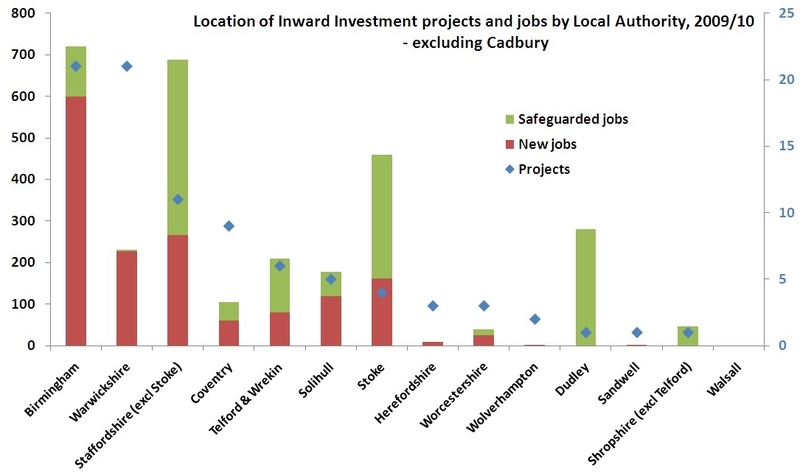 See the chart below showing the projects and job numbers by local authority (but note that the 2,900 Cadbury employees acquired by Kraft have been excluded as it dramatically skewed the figures for Birmingham). It’s interesting to note the vast majority of jobs in Warwickshire were new jobs, whilst the majority in Dudley were safeguarded. 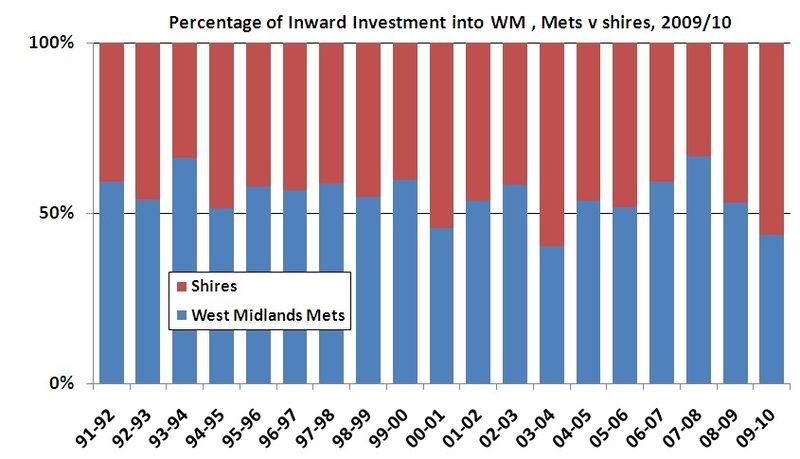 Furthermore, despite Coventry having the fourth highest number of investment projects there were — as with many other authorities — relatively few associated jobs. This is not necessarily a negative result as many of the projects which were attracted to the area were in the smaller high skill/high value/high growth businesses: business involved in ICT, software development, business-to-business services, specialised finance and medical technology. You got a number for the cost per job of these inward investment projects?